Most business owners feel at some point in their career that they need some more help in connection to growing their business or get it off the ground or make it more successful and profitable. However, With so many options we have to utilize in our businesses, how do we navigate through all the ideas, coaching offerings, mentor ships, gurus and geniuses out there? 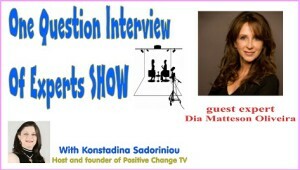 Diana Matteson Oliviera of MyForte International shares with me “how to choose the right mentor or programme” when it comes to achieving business growth. This is our second episode of the “One Question Interview of Experts” Show offered to you via our Positive Change TV. Do you have any other tips on how to choose the right mentor or business growth programme? Do you have any questions that I could help you with? Then please share it in the comments area below. If you liked this blog post please share it!